The latest teen dystopia movie based on a book series comes to the screen with The Darkest Minds. Alexandra Bracken is the author of the trilogy of books, with the titular novel on which the film is based being published in 2012. The story begins from the perspective of Ruby (Lidya Jewitt) who will soon be 10. She sees a classmate die. Soon other children either die or acquire powerful psychic abilities. These changes are a result of what becomes labeled “Idiopathic Adolescent Acute Neurodegeneration” (IAAN). The government and doctors seek to find a cure. On Ruby’s 10th birthday, she inadvertently erases all memories of herself from her parents’ memory. The next morning her mother freaks out when she sees Ruby as she doesn’t recognize her own child. Ruby is hauled off in a bus to a concentration camp for children. Her voiceover announces that all children have been so exiled. Once in the camp, she is tested to see which “color” she is. There are five colors arranged in a pyramidal chart, with red at the top and green at the bottom. “Greens” are super-smart. “Blues” have various levels of telekinesis. “Golds” can manipulate electricity. “Oranges” can control other people’s thoughts. It is not clear what “Reds” do until later in the film. Oranges and Reds are killed once detected. Ruby is detected as an Orange. As the doctor prepares to inject her for death, she grabs his arm and convinces him that she is a Green. He alters her chart. The children are segregated in the camps based on their color designation. Next, Ruby (Amandla Stenberg) is 16. She has pretended to be a Green for six years in the camp but a guard is suspicious of her because she is not super smart like other Greens. After a blast of high-frequency sound, she ends up in the hospital. Cate (Mandy Moore), a “doctor”, actually an activist trying to help children, aids Ruby’s escape from the camp. 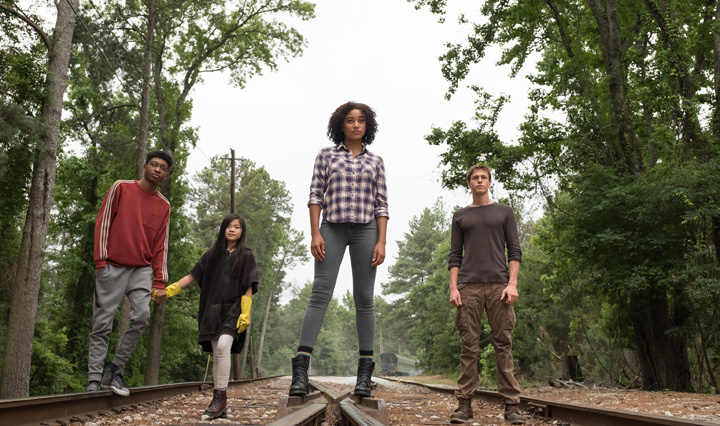 L-R: Chubs (SKYLAN BROOKS), Zu (MIYA CECH), Ruby (AMANDLA STENBERG) and Liam (HARRIS DICKINSON) in Twentieth Century Fox’s THE DARKEST MINDS. Photo credit: Daniel McFadden; TM & © 2018 Twentieth Century Fox Film Corporation. All Rights Reserved. They meet up with Cate’s boyfriend at an abandoned gas station. When Ruby touches him, she sees a disturbing image and runs from the pair. She hides in a van, which is occupied by three others: Liam (Harris Dickinson), a Blue; Chubs aka Charles (Skylan Brooks), a Green; and Zu (Miya Cech), a Gold. After a harrowing escape, she bonds with them and they become friends. Ruby and Liam establish the beginnings of a romantic relationship, complicated by Ruby’s fear of touching him and erasing his memories since she doesn’t feel that she can control her powers. Their goal is to find the camp of the Slip Kid (Patrick Gibson), an Orange who escaped from custody multiple times. After a brief stop at an abandoned mall, they find a clue to the camp’s location. Once they reach the camp, the identity of the leader is a surprise. But things are not what they seem in the camp. Adapting these teen dystopias to film is a tricky business. The books are often long, in this case 488 pages. To reduce this to a workable script, much has to be condensed or omitted. 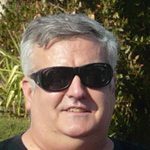 These series’ success is based on three elements: interesting world-building; a compelling conflict; and characters who the reader cares about. So the danger of damaging one of these factors is significant when adapting these types of novels to the screen. Of course this is true of adapting any type of novel but in this case it seems amplified to me. I have not read the book on which this film is based. So I cannot judge whether or not what appear to be inconsistencies in the film are actually addressed in the text. The premise is intriguing. The picture does an excellent job of showing the early stages of the condition and the panic that ensued. The focus is entirely on the United States, although presumably the entire world is affected. It also seems highly believable that fear would cause these kids to go to concentration camps. Obviously it has happened in the past in this country and has been suggested since, for example, in the early days of AIDS. What is unclear to me is why the Greens are in camps. If they are super smart, the government almost certainly would use them to create more destructive weapons and for other military purposes. If nothing else, maybe they could cure diseases. Instead we see them on an assembly line lacing shoes. When young Ruby erases her parents’ memories of her, what about the existence in the house of photos and other mementos? Wouldn’t that give one pause about why you had so many items of a total stranger in your home? The plot also suffers from a villain who at least twice has to explain what is going on or what he is going to do to his victims. There is one very horrific scene of sexual assault that he is involved in, although otherwise the romance in this film borders on the near-chaste. One also has to wonder why we do not see children or teens who are not Reds (and it is unclear in the film what their motivation is based on) misusing their power for malevolent or selfish purposes. We see them using their powers to fight back, in some cases brutally. We also see a scene where one group pranks another group with their powers. But the vast majority of the children and teens seem to live in harmony with each other. I cannot but help see the image of Billy Mumy in ‘The Twilight Zone” classic episode, “It’s a good life” where he sent people into the cornfield who displeased him. 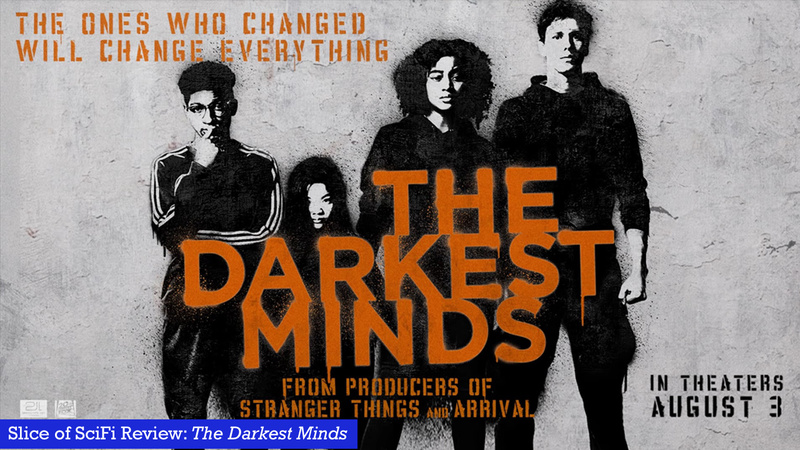 In “The Darkest Minds,” is this abuse of powers not as likely as the normal kids and teens that we see not abusing their powers? What about the effect of hormones on teens? The omission affects the credibility of the premise. The acting by the four main characters is a highlight of the film. Amandla Stenberg is a natural, and conveys the fear, awkwardness and confusion as well as the occasional happiness of Ruby. Her chemistry with Harris Dickinson is excellent and they are a likeable couple. Dickinson also seems like a regular teen caught up in the initial throes of romance. Skylan Brooks and Miya Cech get the most out of their sidekick roles. All the other actors are not given significant lines, so end up being ciphers or caricatures. The visual effects, especially of Liam’s use of his telekinesis, are superb. There also is a good chase scene. Since the film is setting up for a sequel, the last scenes are particularly bittersweet. The ending is a teen dystopian cliché, with the obligatory voiceover manifesto. While the film featured a good premise, some fine acting and excellent visual effects, I did not find the plot to be compelling. It seemed like a typical misunderstood-fugitives- on-the-run theme, with a few bonus features thrown in. However, I am intrigued enough to go read the book, which I hope fills in some of the gaps which I cited.